"Volusia" redirects here. For the unincorporated community, see Volusia, Florida. Volusia County (/vəˈluːʃə/, və-LOOSH-ə) is located in the east-central part of the U.S. state of Florida, stretching between the St. Johns River and the Atlantic Ocean. As of the 2010 census, the county was home to 494,593 people, an increase of 11.6% from 2000. Its county seat is DeLand. It was founded on December 29, 1854, and was named for the community of Volusia, located in northwestern Volusia County. The land area of present-day Volusia County was inhabited by the indigenous Timucua, and Mayaca people . Neither group exists today as distinct racial entities, having been decimated by war and disease after contact with European settlers. Evidence of their habitation can still be seen in various areas of Volusia County such as the large shell middens at Tomoka State Park. During the British occupation of Florida, a failed colony was started in southeast Volusia County by Andrew Turnbull, known as New Smyrna. This colony was connected to St. Augustine, the capital of East Florida, via the Kings Road. After the failure of the colony the settlers, many of Minorcan and Greek heritage made the 70-mile (110 km) journey to live in St. Augustine. The Seminole Indians, descendants of the Creek tribe of Alabama and Georgia who resisted forced relocation to Indian Territory also camped in various parts of Volusia County. 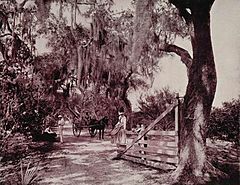 During the Second Seminole War (1836–1842) a large sugar plantation in what is today the city of Daytona Beach was burned by the Seminole. On the east shore of the St. Johns River in Volusia, in present-day DeBary, General Winfield Scott established a fort/depot in 1836 named Fort Florida. According to the U.S. Census Bureau, the county has a total area of 1,432 square miles (3,710 km2), of which 1,101 square miles (2,850 km2) is land and 331 square miles (860 km2) (23.1%) is water. Volusia County is bordered on the west by the St. Johns River and Lake Monroe, and by the Atlantic Ocean to the east. Roughly the size of Rhode Island, Volusia is situated 50 miles (80 km) northeast of Orlando, 60 miles (97 km) north of the Kennedy Space Center, and 89 miles (143 km) south of Jacksonville. East Volusia - also known as the Greater Daytona Beach Area, or the Halifax Area (named for the Halifax River which runs through the area), this region includes the cities of Daytona Beach, Daytona Beach Shores, Holly Hill, Ormond Beach, Ponce Inlet, Port Orange and South Daytona; and the surrounding unincorporated areas close to these cities. Southeast Volusia - also known as the Greater New Smyrna Beach Area, this region includes the cities of New Smyrna Beach, Edgewater, and Oak Hill; also the unincorporated areas close to these cities. 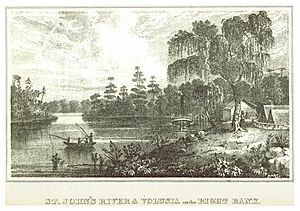 West Volusia - also called Saint John's River Country (named for the Saint John's River which lies nearby), this region includes the cities of Barberville, DeBary, DeLand, DeLeon Springs, Deltona, Glenwood, Enterprise, Lake Helen, Orange City, Pierson, and Seville; as well as the surrounding unincorporated areas close to these cities. Deltona is the largest city in Volusia County. As of the census of 2000, there were 443,343 people, 184,723 households, and 120,069 families residing in the county. The population density was 402 people per square mile (155/km²). There were 211,938 housing units at an average density of 192 per square mile (74/km²). The racial makeup of the county was 86.11% White, 9.29% Black or African American, 0.31% Native American, 1.00% Asian, 0.04% Pacific Islander, 1.82% from other races, and 1.43% from two or more races. 6.57% of the population were Hispanic or Latino of any race. 13.7% were of German, 11.5% Irish, 11.2% English, 10.7% American and 8.7% Italian ancestry. In the county, the population was spread out with 20.30% under the age of 18, 8.20% from 18 to 24, 25.30% from 25 to 44, 24.20% from 45 to 64, and 22.10% who were 65 years of age or older. The median age was 42 years. For every 100 females there were 94.50 males. For every 100 females age 18 and over, there were 91.80 males. The median income for a household in the county was $35,219, and the median income for a family was $41,767. Males had a median income of $30,573 versus $22,471 for females. The per capita income for the county was $19,664. About 7.90% of families and 11.60% of the population were below the poverty line, including 16.30% of those under age 18 and 7.10% of those age 65 or over. Interstate 95 is the main south-to-north interstate highway along the east coast of the state as well as Volusia County. Eight interchanges exist within the county, three of them in Daytona Beach. Interstate 4 is the main west-to-east interstate highway through Central Florida, however it also serves as the westernmost interstate highway in the county. Contains at least seven interchanges and becomes State Road 400 east of I-95. U.S. 1 is the main local road through eastern Volusia County, running south to north. Served as the main south-to-north highway in both the state and the eastern half of the county until I-95 was built. US 17 is the main local road through western Volusia County, running south to north. US 92 a west-to-east route shares a concurrency with US 17 further south in Polk County until branching off onto the International Speedway Boulevard. SR A1A is the scenic coastal alternate route to US 1, which also includes some county road spurs and extensions. SR 40, a west-to-east road in northern Volusia County enters the county from the Astor Bridge over the St. Johns River and heads east towards Ormond Beach. SR 44, a west-to-east road in southern Volusia County enters the county from the Crows Bluff Bridge over the St. Johns River and heads east towards New Smyrna Beach. SR 46, a west-to-east road on the southwestern corner of Volusia County enters the county from the Mims Bridge over the St. Johns River and quickly enters Brevard County with no major junctions whatsoever. SR 5A is Nova Road, a suffixed alternate route of State Road 5, the unsigned hidden state road for US 1. It spans from Port Orange to Ormond Beach. SR 11, a scenic south to north road that runs from US 17 north of DeLand to US 1 in Bunnell in Flagler County. SR 483, a south-to-north state and county road that runs west of SR 5A spanning from Port Orange to Holly Hill. Runs along the eastern border of both Daytona Beach International Airport, and Daytona International Speedway. Volusia County Public Transit System (VOTRAN) is the local Volusia County bus service. The buses offer service throughout the county, Monday through Saturday, from 7 a.m. to 7 p.m. and is handicapped-accessible. Limited service is offered in East Volusia in the evenings and on Sundays. The cost is $1.25 per trip, $3.00 for a one-day bus pass, or $40 for a 31-day pass (valid for all VOTRAN routes). Passenger Train service to Volusia County is provided by Amtrak on the Silver Meteor and Silver Star routes. Service between Volusia County and Orlando is provided by SunRail, a commuter rail line running from Volusia to Orange County. The initial phase of the project commenced in 2014 and will extend service to as far north as DeBary. A planned expansion will include the DeLand Amtrak station in 2015. The life-sized Wright Flyer statue at the Embry-Riddle Aeronautical University Daytona Beach campus. Volusia County, Florida Facts for Kids. Kiddle Encyclopedia.